Care Bears & #CBcousins - a TWEETY FIESTA and a Brand New Show!!! 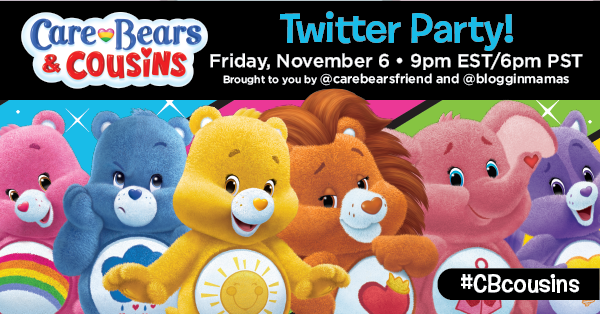 November 2, 2015November 5th: Join @carebearsfriend & @blogginmamas for the #CBcousins Twitter Party tomorrow night @ 9p ET RSVP bit.ly/cbcousinspartyNovember 6th: Join Me along with @carebearsfriend & @blogginmamas for the #CBcousins Twitter Party TONIGHT @ 9p ET RSVP bit.ly/cbcousinspartyDuring the Twitter Party there will be a chance to win one of the following prizes by answering various questions about the Care Bears & Cousins. Winners will be selected at random from all eligible entries. 1– Care Bears Prize Pack with a $50 Netflix Giftcard and Five (5) Blind Packs US Residents age 18 and over are eligible to enter.